We live at a time of both overwhelming crisis and unparalleled opportunity. A time of bleak destruction and blooming hope. We face not only an environmental crisis, but an existential one; will humanity rise to the greatest challenge we have ever faced, or recklessly defend ‘business as usual’ at the expense of life itself? Released by the Women’s Earth and Climate Action Network (WECAN International) on September 9th, 2014, the Women’s Climate Action Agenda provides a bold answer to this question; we must and we can rise to transform a broken system and re-vision our collective future. 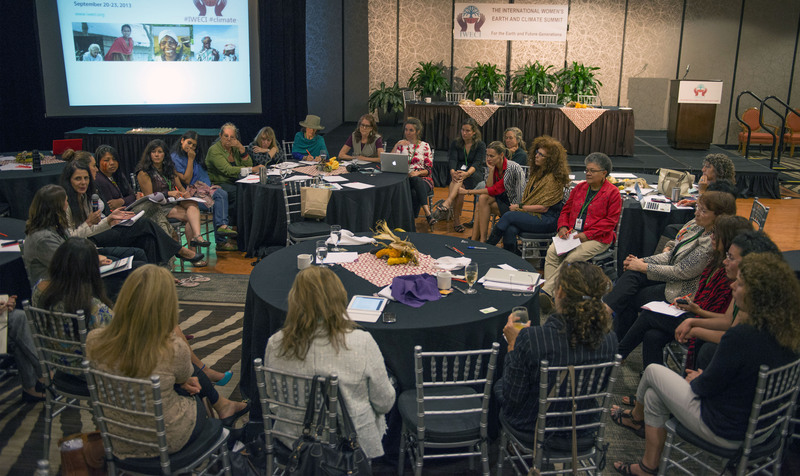 The initial vision of the Women’s Climate Action Agenda emerged with input from more than 100 women leaders from across the globe, united at the International Women’s Earth and Climate Summit in 2013. In its final form, the 80 page document represents the synthesis of decades of academic research, policymaking, and on-the-ground activism and experience in frontline communities. Crucially, in both its authorship and its vision moving forward, the Action Agenda bridges North/South divides and encourages cross-sectoral collaboration between academics, activists, scientists, policymakers, businesspeople, and everyday Earth citizens. 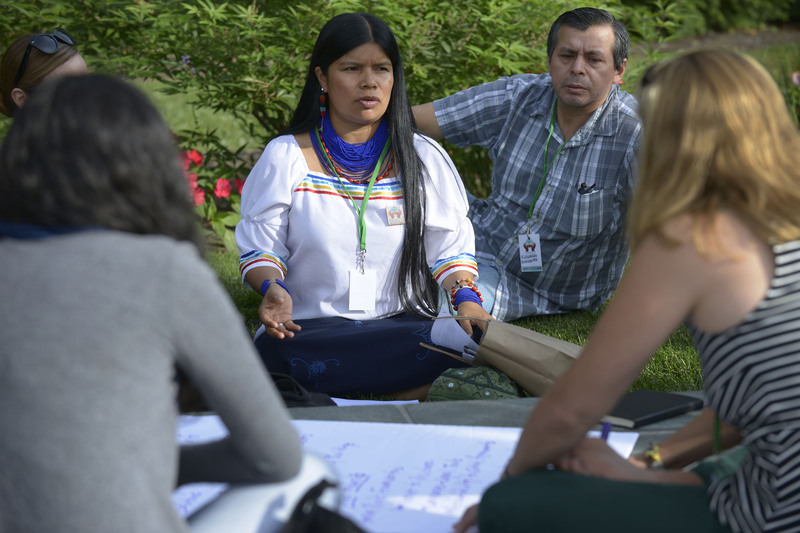 The Action Agenda does not treat the climate crisis and social and environmental injustice as abstract concepts, but rather recognizes that communities across the globe are already feeling the impacts, and that women and Indigenous peoples are facing disproportionate threats. Deeply aware that we have no time to loose, the document provides concrete solutions and policy recommendations that we can begin to implement now. Delegates at the International Women’s Earth and Climate Summit. Photo by Lori Waselchuk. The Women’s Climate Action Agenda includes sections on fossil fuel extraction and resistance, green business and 100-percent renewables, agriculture, food and seeds, forests and biodiversity, fresh water and oceans, cities and lifestyle, climate finance and economics, indigenous peoples, and women and climate leadership. Each section contains an analysis of the issue and its root causes, an action plan outline, and policy recommendations. 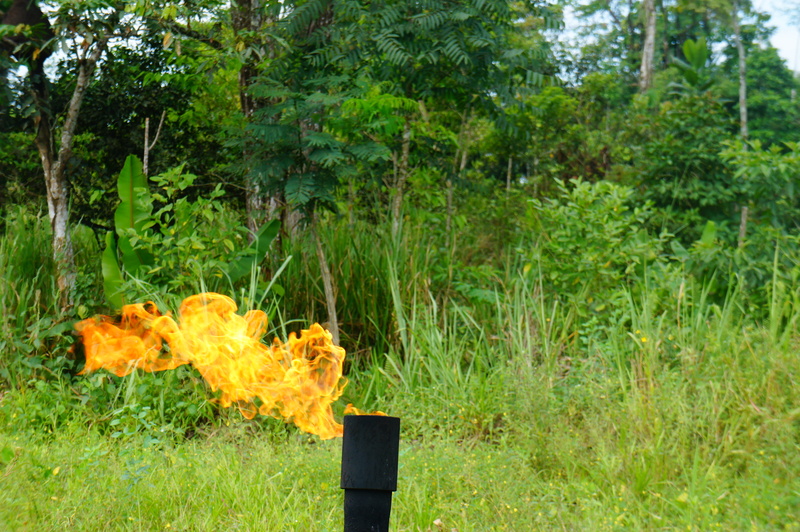 A sample of the key solutions put forth includes immediate fossil fuel divestment, the implementation of legal Rights of Nature, the end to market based climate mechanisms, the localization and democratization of food systems, and the amplification of the voices of Indigenous peoples and women in all decision making processes. 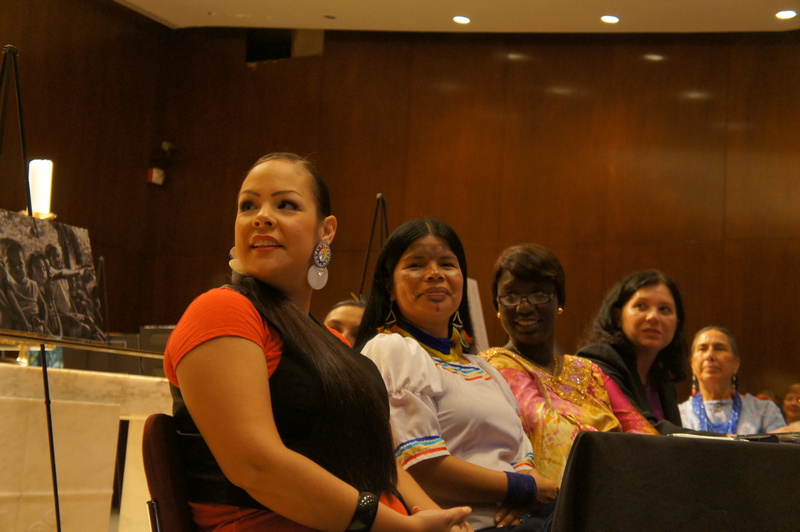 Patricia Gualinga of Sarayaku, Ecuador at the Women’s Earth & Climate Summit. Photo by Lori Waselchuk. 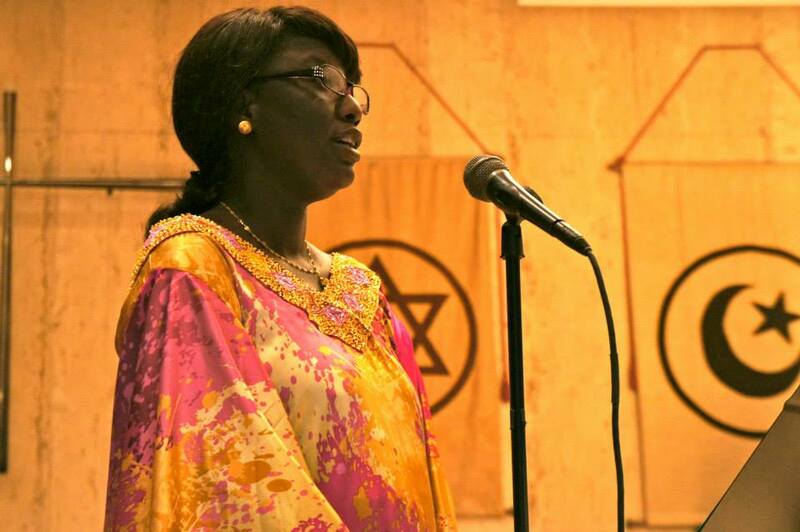 Since it’s release in early September, WECAN International members and allies have been circulating the document widely and striving to build the momentum and alliances needed to implement solutions. On the ground in New York City in for the United Nations Climate Leadership Summit, People’s Climate March, and Climate Week 2014, WECAN International worked ceaselessly to distribute the Action Agenda to activists from across the globe, as well as to key international policy makers, businesspeople, and indigenous and civil society leaders. 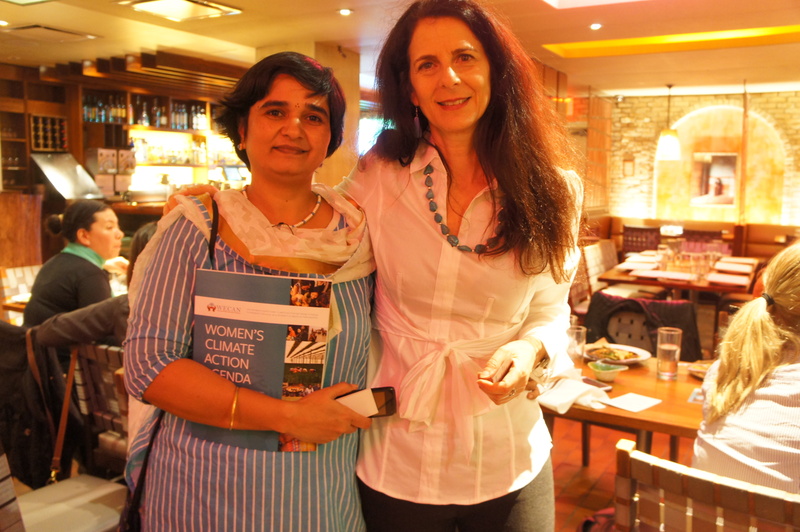 WECAN International Executive Director, Osprey Orielle Lake with Vaishali Patil, global climate ambassador and activist from India. Photo by Emily Arasim. 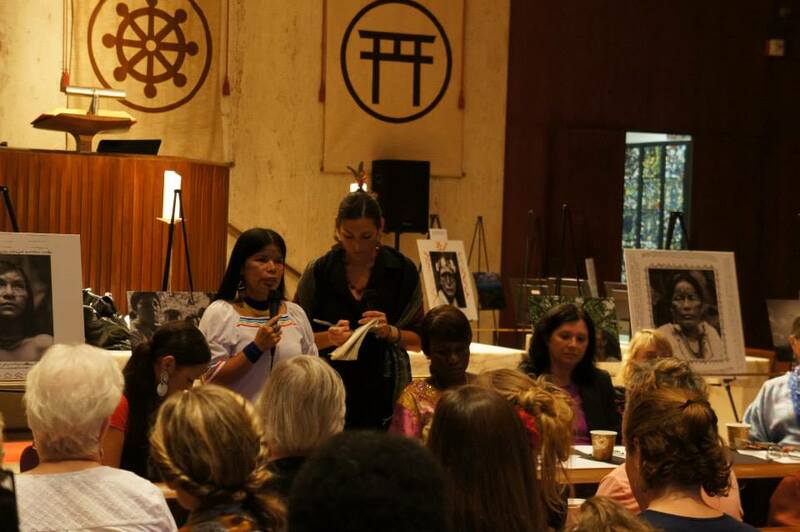 On Sept. 22, WECAN International co-Founder and Executive Director, Osprey Orielle Lake, attended the ‘Leaders Forum on Women Leading the Way: Raising Ambition for Climate Action’, presented by the Mary Robinson Foundation for Climate Justice and UN Women. WECAN Executive Director, O.Lake, presents the Action Agenda to UNFCCC Secretariat C. Figueres. Photo by Emily Arasim. 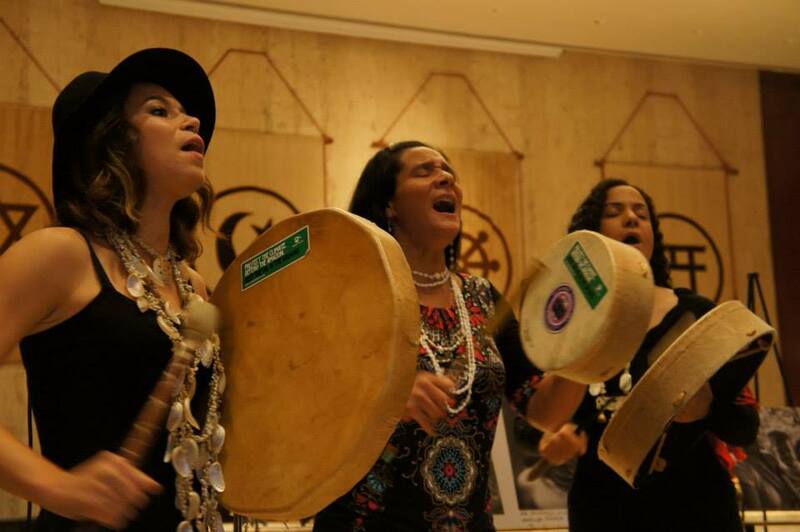 The following day, Sept. 23, Lake was joined by WECAN International co-Founder Sally Ranney, WECAN Coordinator for the Middle East/ North Africa Region, Fadoua Brour, and WECAN Coordinator for Latin America, Carmen Capriles, at the official United Nations Climate Leadership Summit. In attendance as part of a small civil society delegation, the four were able to evaluate proceedings first hand and speak with representatives from across the globe. 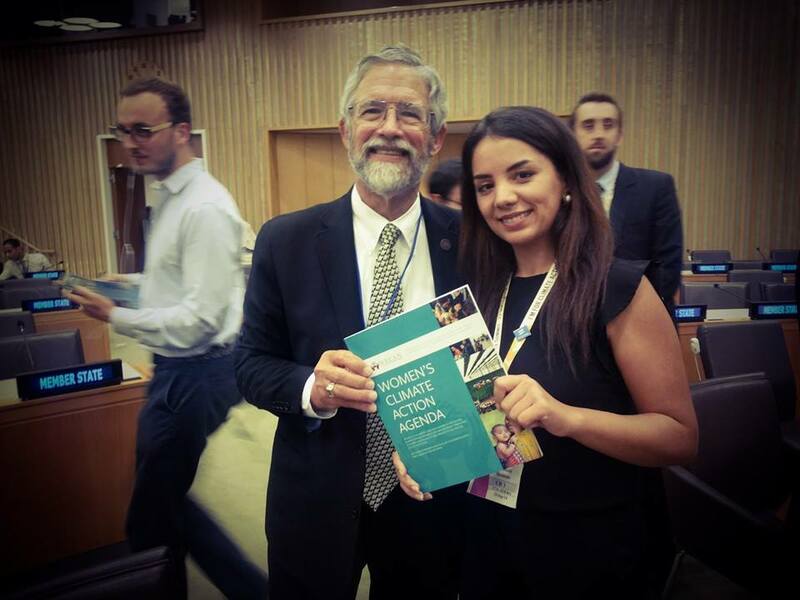 Fadoua Brour presents the Action Agenda to John Holdren, science advisor to President Obama. 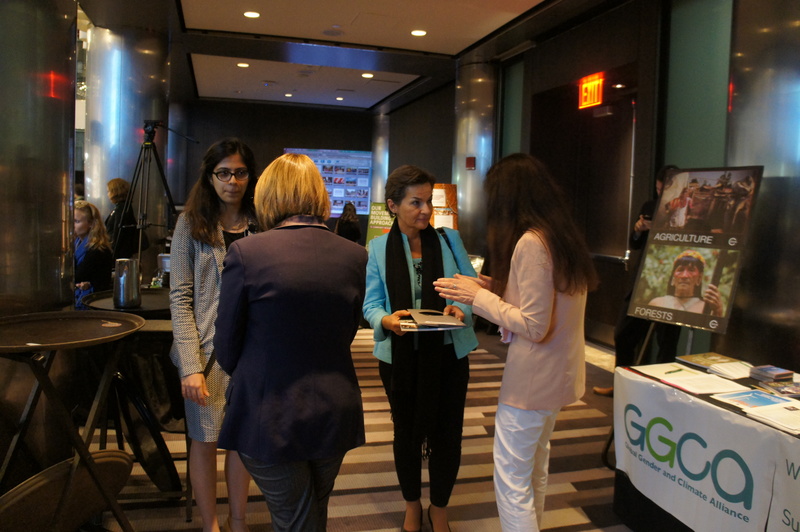 At the two events the women presented copies of the newly released Women’s Climate Action Agenda to several top international political figures, including UNFCCC Secretariat Christiana Figueres, former President of Ireland and current U.N. Special Envoy to Climate Change, Mary Robinson, and John Holdren, science advisor to U.S. President Obama. 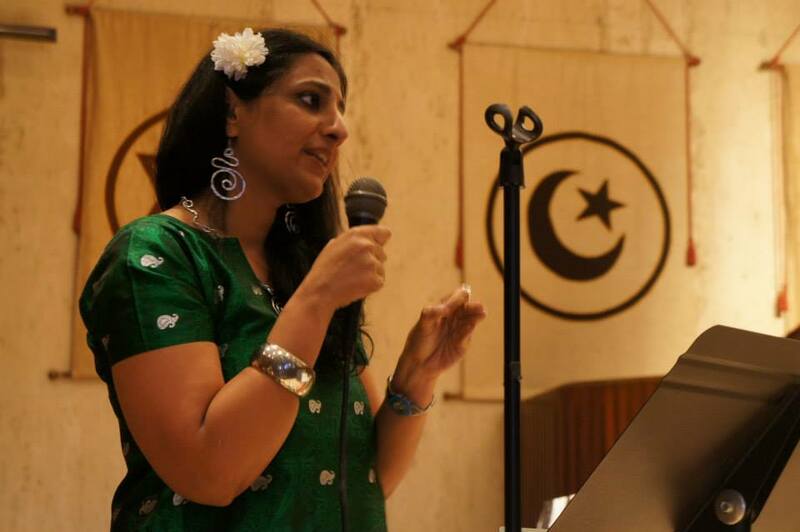 Throughout the week, WECAN International women were also able to engage with countless grassroots and community leaders, undoubtedly the true heart of the movement for climate justice and solutions. In the coming months, WECAN International will continue to work to share and implement the analysis and plans of action set forth in the document. The Action Agenda will further serve as a key tool for advocacy work at the 2015 UN Climate Negotiations in Lima and Paris. 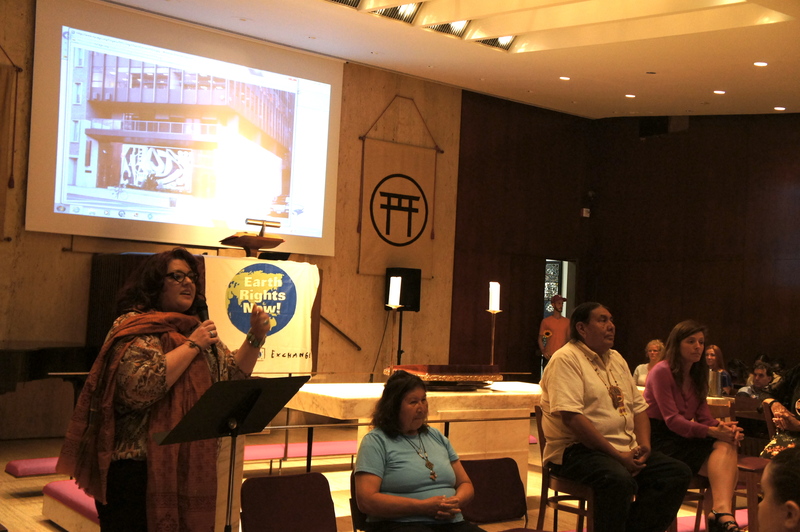 Deeply aware of the crisis created by systems that value growth and profit above all else, an extraordinary group of panelists gathered to speak out at ‘Rights of Nature and Systemic Change in Climate Solutions’ on September 22, 2014. The event, presented by the Women’s Earth and Climate Action Network (WECAN International) and the Global Alliance for the Rights of Nature, was held as part of the mobilization surrounding the People’s Climate March and U.N. Climate Summit in New York City. 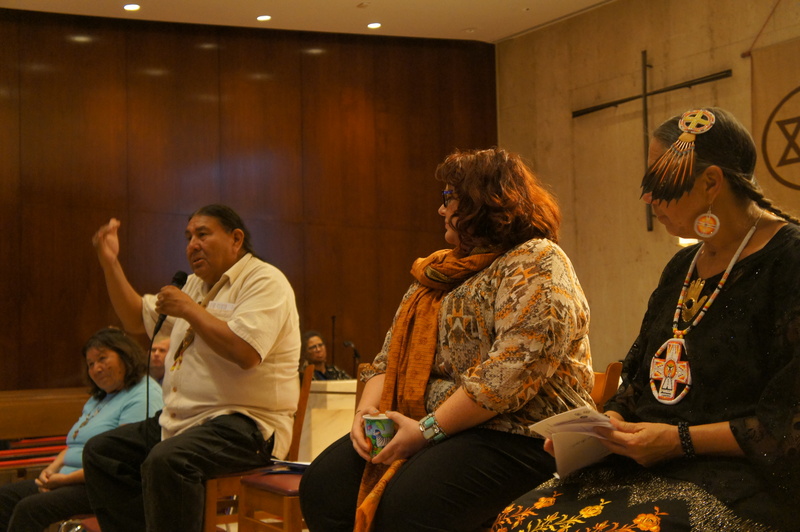 Rich with varied voices and perspectives, the event focused on the need to redesign our social, political, economic and legal structures to function with respect to the rights of the Earth and the knowledge systems of the original stewards of the land, the worlds indigenous peoples. Tom Goldtooth (Indigenous Environmental Network), Shannon Biggs (Global Exchange), Gloria Ushigua (Association of Sapara Women, Ecuador), Linda Sheehan (Earth Law Center), and Casey Camp-Horinek (Ponca Nation, Indigenous Environmental Network) joined Lake to expose fundamental flaws in our current laws and management schemes, while presenting bold strategies for re-visioning them. The issue could not be more critical, presenters explained, as a shift to a legal framework and knowledge system that sees the Earth as a living being with inherent right is a requirement for any genuine climate solution. 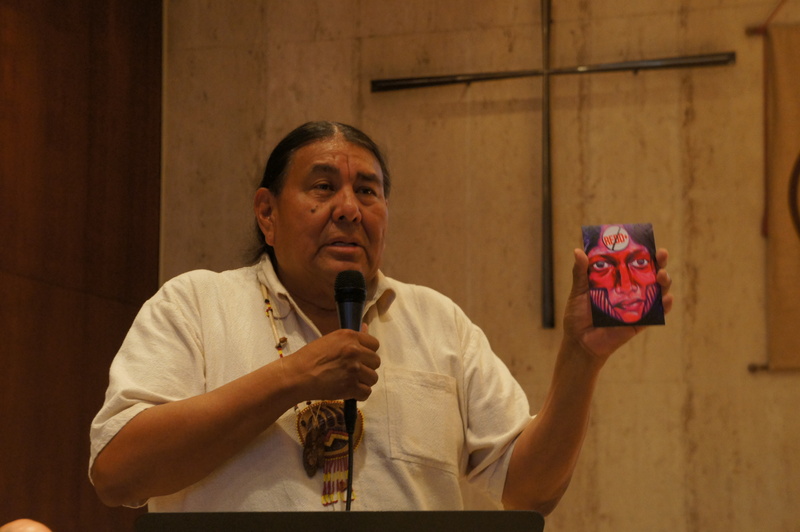 Tom Goldtooth of the Indigenous Environmental Network took the floor first, focusing on the need to learn from and re-align with indigenous knowledge which conceives of the Earth as a vibrant, living Mother who must be cared for and respected. 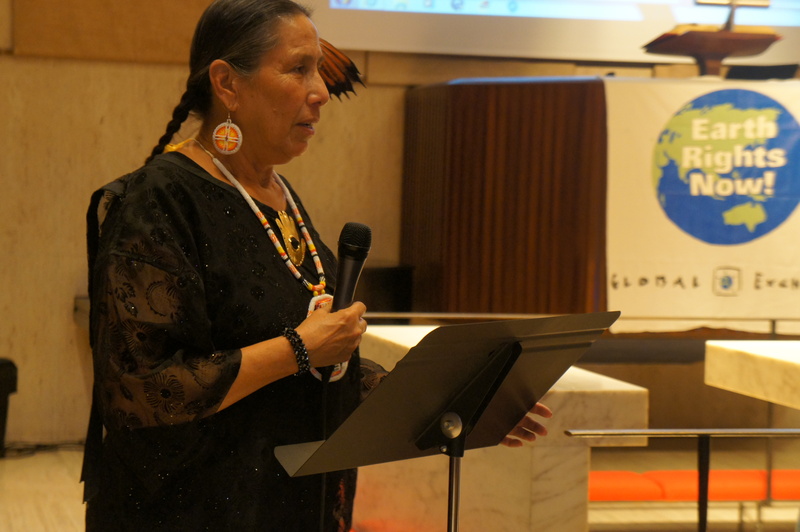 Linda Sheehan of the Earth Law Center spoke next, reaffirming and expanding up Tom Goldtooth’s sentiment that our plans of action, movements, laws and policies must function with respect to the Rights of Nature. 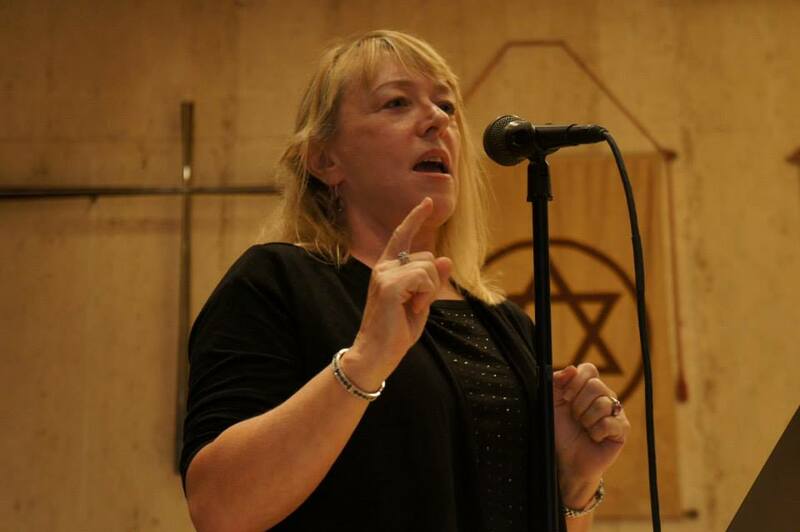 According to Linda, our current legal structure overwhelmingly views the Earth as an entity to be traded and degraded, resulting in continued exploitation and failing policy. “We think we can chop up nature, we can control it. This is simply a misunderstanding,” she explained. Working to challenge this flawed vision, Linda and allies at the Earth Law Center have joining forces with groups across the U.S. to create and instate new laws that put the rights of the Earth and communities above those of corporations, including notable successes in Santa Monica, California this year. 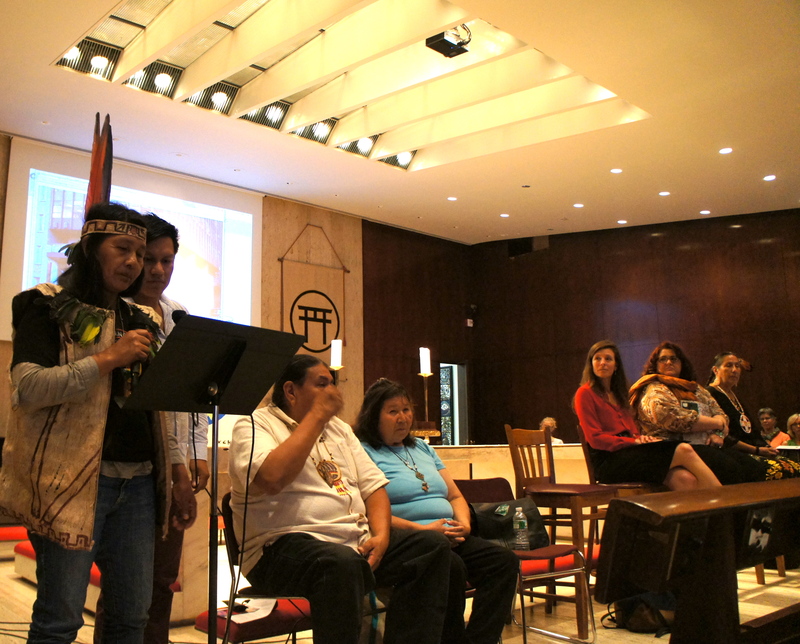 From the frontlines of the fight to end fossil fuel extraction in the Amazon Basin, Gloria Ushigua of the Association of Sapara Women, Ecuador shared her story next. 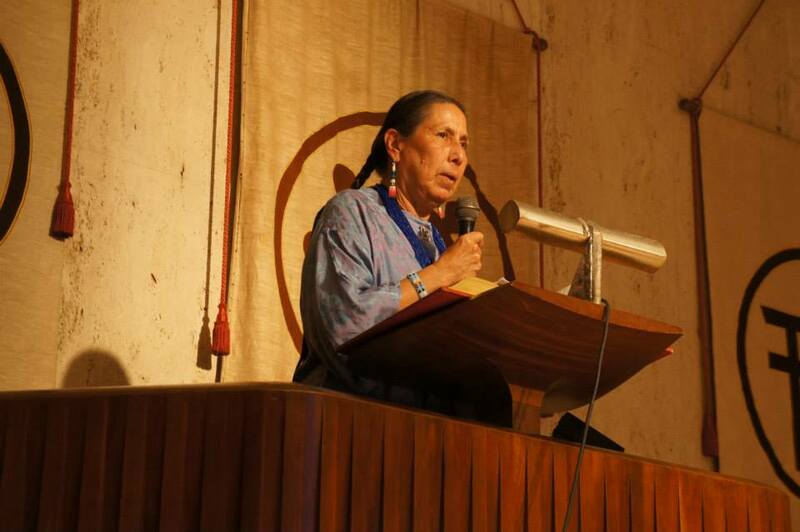 “We are here to defend our rights, our spirits, our forests,” Gloria explained, highlighting the ways that indigenous communities across the world, embedded firmly in a tradition that sees the Earth as a flourishing and living being, are already challenging conventional models and leading the way towards climate solutions. Gloria’s words however, shook up the conversation as she explained how despite Ecuadorian law that officially gives rights to Nature, massive corporate and political violations continue. Ultimately, changing our legal framework must thus be but the first step, to be followed up with ceaseless civil society action to insure that these rights are respected on every level. 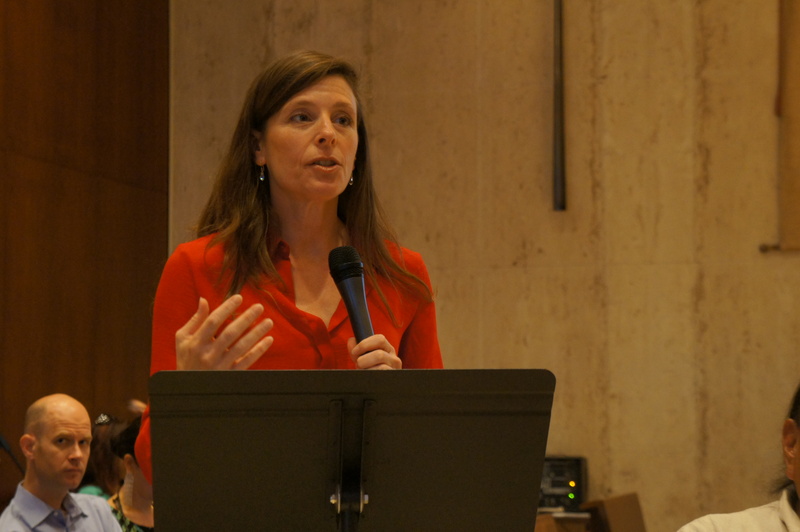 Shannon Biggs of the Global Exchange spoke next, expanding upon Gloria’s declaration that systemic change in climate solutions and our relationship with the Earth must come not only at the policy level, but at the level of communities and individuals across the globe. Shannon continued on to detail the concrete ways that the Global Exchange and its partners are working to expand local ability to implement and enforce the Rights of Nature, focusing on community applications of these principles as tools for climate resiliency and the protection of the Earth. Casey Camp-Horinek of the Ponca Nation and Indigenous Environmental Network took the floor as the final presenter of the day. 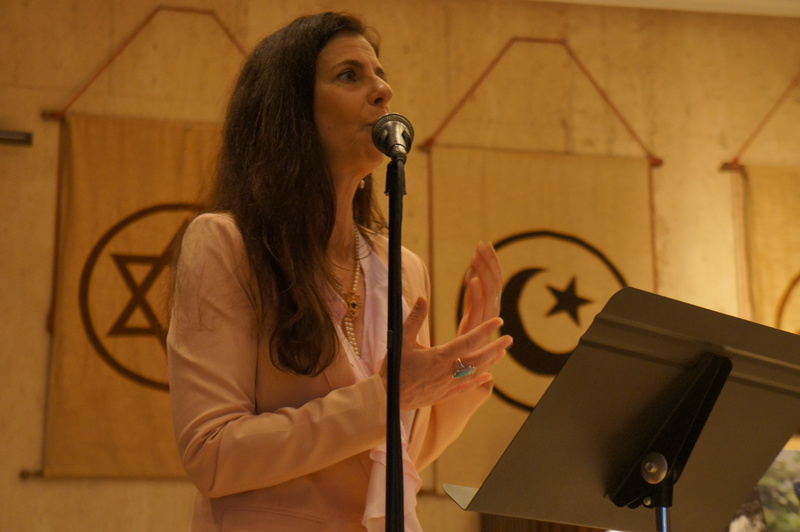 Her speech was one of hope, explaining to the audience that while the task of uprooting and re-visioning the dominant system seem daunting, this is only so when constrained under the impression that politicians and economists are the center of ultimate power. “If the sun did not rise today, would you be here? If you did not have a drink of water, would you be here today? 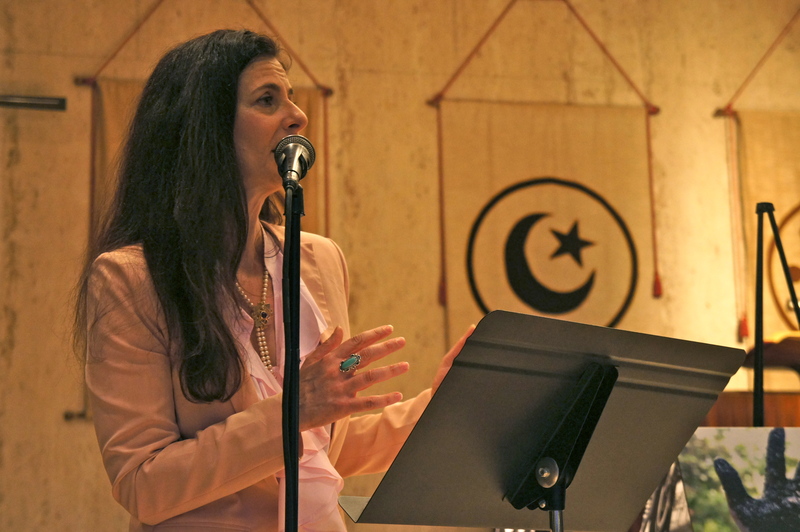 THAT is the true power,” Casey explained, the audience erupting in applause. 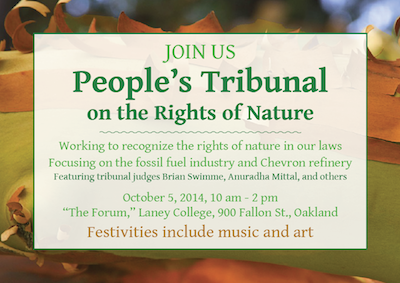 All of the presenters are engaged with a dynamic process of conducting Rights of Nature Ethic Tribunals. 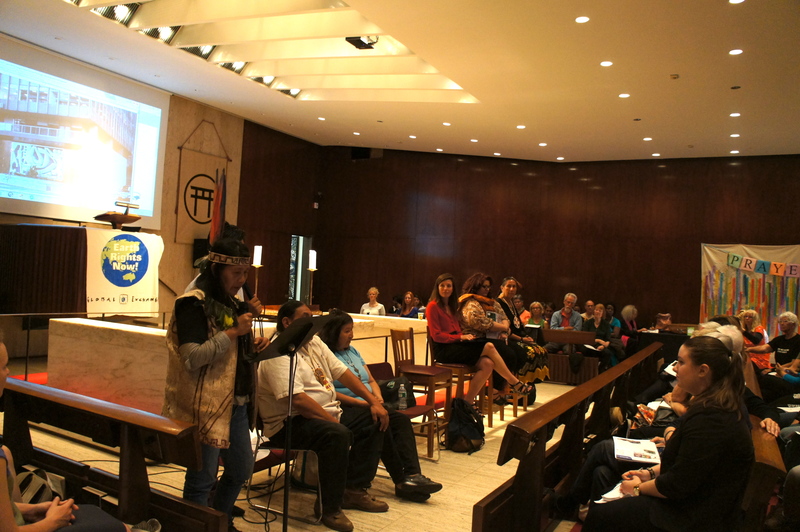 The first was held in Ecuador earlier this year, followed by a October 5th Tribunal in the San Francisco Bay Area (click here to read more!) and upcoming December 2014 Tribunal in Peru. Crucially, these Rights of Nature Tribunals demonstrate how a new legal framework, embedded in principles of the Rights of Nature, can be successfully used as a tool for ending corporate exploitation and building climate resiliency and solutions. 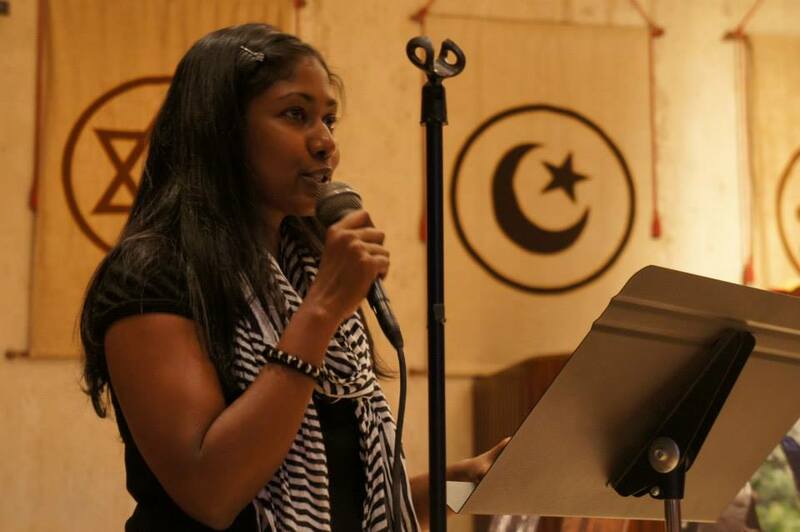 Building momentum after the People’s Climate March and U.N. Climate Summit, WECAN International and the Praxis Peace Institute will hold ‘The Economics of Sustainability: Emerging Models for a Health Planet’ Conference in San Francisco, California between October 6th and 9th, 2014. How will we mitigate the effects of climate change and build a new economy in a way that honors the Earth and puts people before profit? The Conference will include workshops, networking meetings, action groups, and outstanding presentations from economists, scientists, activists, and leaders in the environmental movement. Ultimately, the goal of the multi-day event is to launch a platform for systemic economic, cultural, and political change, and to provide a space for organizations and individual to work collaboratively in this pursuit. 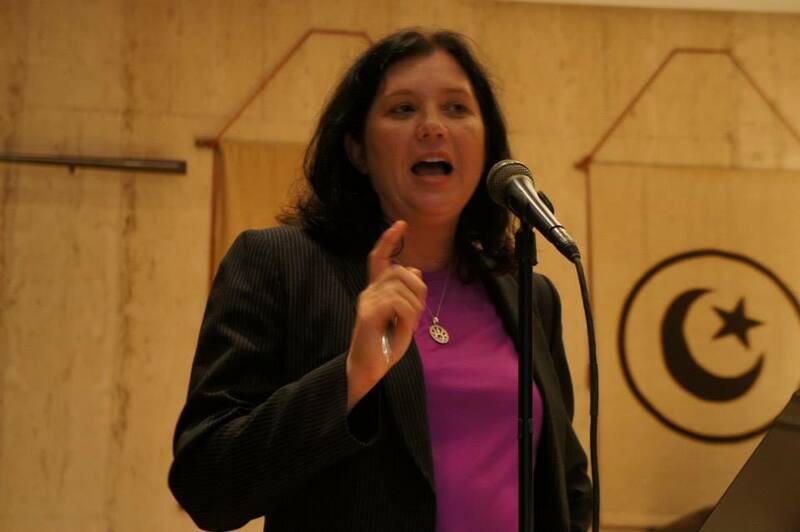 Osprey Orielle Lake, Co-Founder and Executive Director of WECAN International, will present a keynote speech at the event, surrounding the theme ‘Rights of Nature and Earth Economics’. “If our environmental law and economic systems were working we would not be in this multitude of crises. 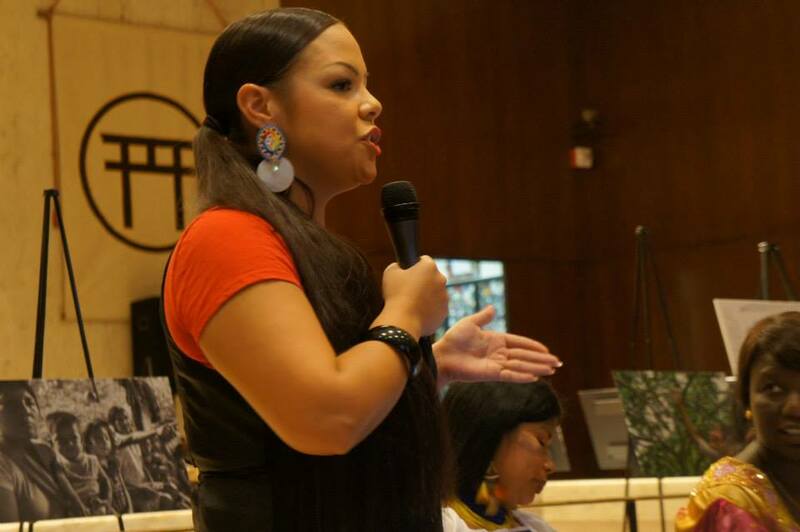 We need our legal and economic frameworks to abide to by laws of Nature and to address social injustice,” explained Lake, providing a sneak peak into her presentation at the conference.